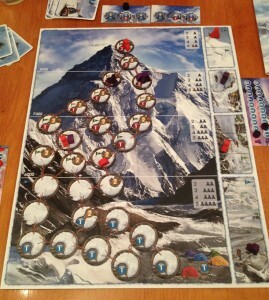 As you would expect, K2 is a game about climbing the mountain K2. 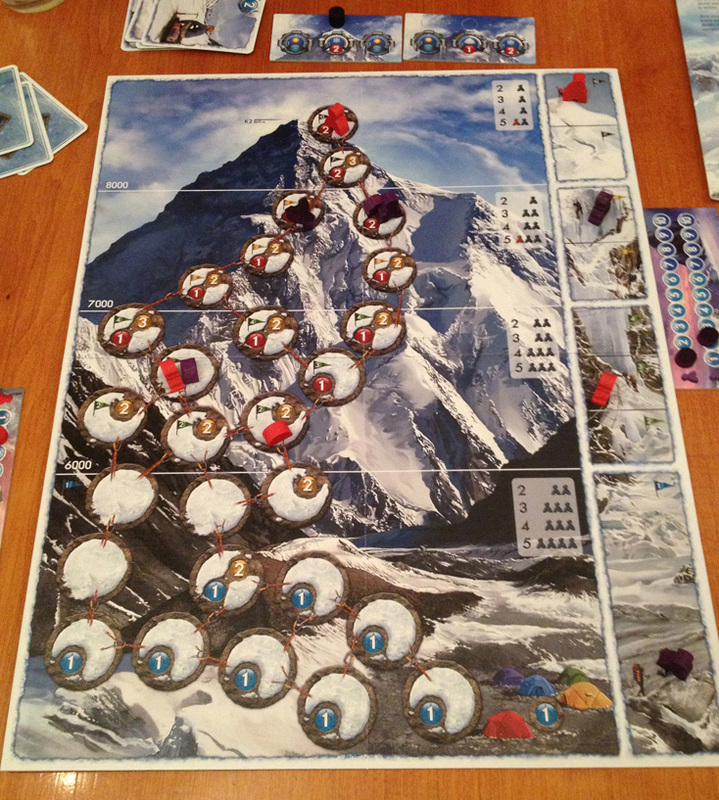 Players each have two climber meeples and score points based on how high their climbers reach; however, any climbers that perish only score 1 point no matter how they had ascended. Each player has an identical set of 18 cards and each turn they pick 3 of the 6 cards from their hand. Cards can be climbing cards (values range from 1 to 3) or acclimatisation cards (used to increase your climbers’ health). Once selected, all players reveal their 3 cards simultaneously. The player with the highest climbing total must take one of the 3 face-up risk tokens. 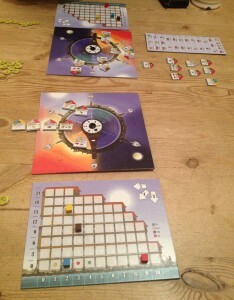 These tokens range in value from 0 to 2 and the player must pay that cost with movement points, acclimatisation points, or their climbers’ health. A new token is revealed to make a total of 3 for the next round. On their turn, players allocate each of their 3 cards to either of their climbers to move them, pitch a tent, or increase their health. If a climber’s health goes above 6, it always goes down to 6 at the end of each turn, which adds a nice limit so climbers are never too far from the chance of perishing. A long time has passed since my last review. My apologies for such a prolonged gap which has sadly been due to some unavoidable stuff which has been very frustrating and made all the worse as there are so many games I’ve wanted to tell you about and have not had a chance. However, I shall be adding new reviews once again starting today with K2. 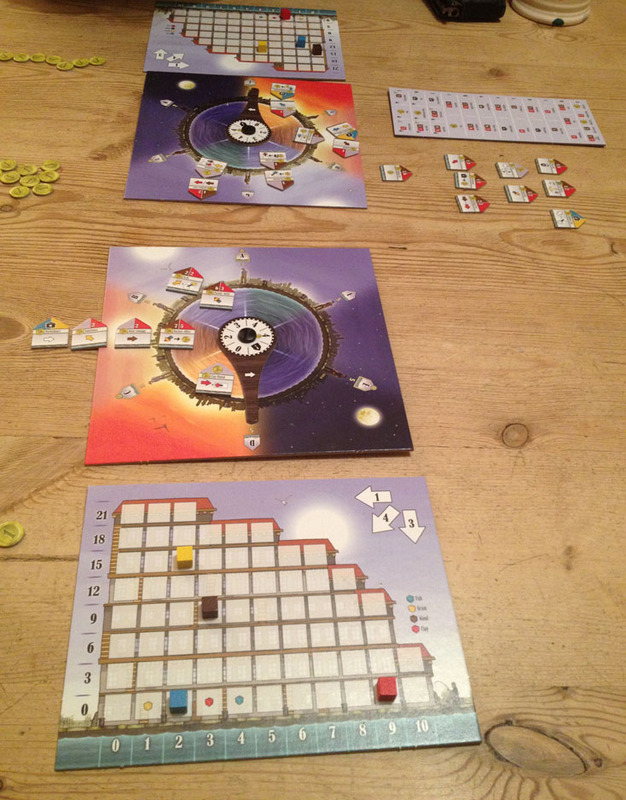 I’ll be adding reviews of the other main games I played at Spiel back in October as well as many others including X-Wing Miniatures Game, Archipelago, Rattus: Card Game, and Le Havre: The Inland Port.